Create professional-looking, mouth-watering food arrangements. 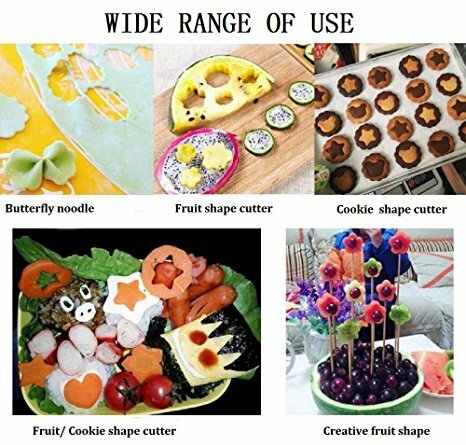 This special cutter will help you create unique shapes of fruit or veggies for your parties, birthdays or simply for your little kids, they'll love it for sure. Creates fun, healthy snacks and make mealtime so much fun. The cutter can be used with fruits, vegetables, crackers, bread, cookies, cheeses, and more, it's easy to use all you have to do is push and pop, no knives or sharp tools needed! This amazing kit includes a Push & Pop Tool and six fun shapes to cut your fruit with! Push & Pop out nice treats in seconds for yourself and kids. Make mouth watering masterpieces! Fast and simple, shapes in seconds. Healthy snacks, cake decorating, party treats and more. Perfect for Holiday and special occasions. Cut thin or thick foods. 6 shapes - Circle, Heart, Flower, Butterfly, Sun and Star. It's perfect for holidays and other special occasions- make mouth-watering masterpieces in no time. Help encourage healthy eating for the little ones by creating fun shapes from healthy snacks!